> How bout a Nightcap? Here’s a fun little pattern to embellish your gifts of spirits for the New Year. 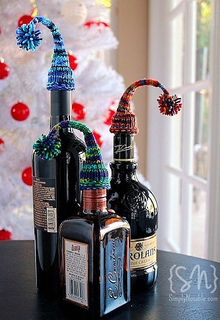 These sweet little stocking caps look adorable perched atop bottles of all kinds. Knit them in the round with small amounts of scrap yarn in about 30 minutes, then pat yourself on the back for avoiding buying another expensive, throw-away bow!